During her 20-year career in Brazil, Mafalda Minnozzi has long been recognized for her joyful style and the sincerity with which she has presented countless songs from her native Italy, popularizing the flavor and romanticism of Italian music that strongly influenced MPB (Brazilian Popular Music) during the 1960s. She accomplished this via many concert tours in Brazil while at the same time producing CDs and DVDs of rare beauty, always accompanied by great Brazilian musicians who contributed by highlighting the talent and charisma of her performances. 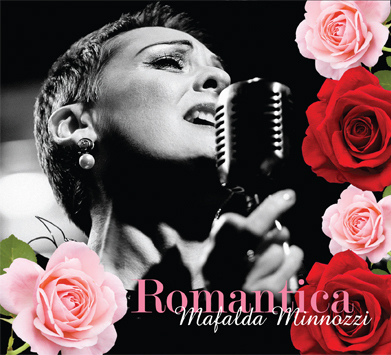 The new CD “ROMANTICA” brings together all of this: the virtuoso singing of Mafalda Minnozzi, refined arrangements, the energy of the band of renowned musicians, the theater’s atmosphere and the participation of the audience won over by the passionate tribute to the great composers of Italian pop music’s golden age such as Sergio Endrigo, Domenico Modugno, Pino Donaggio and Umberto Bindi. The final result is a precious musical pearl that is absolutely not to be missed.